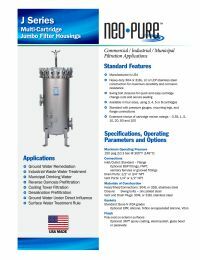 Neo-Pure SBJ170 Replacement FiltersNeo-Pure SBMJ8 Multi-Cartridge Jumbo Filter Housing provides unparalleled filtration with eight jumbo filter cartridges for flow rates up to 1200 gpm. The V-band clamp also allows quick change-outs and secure sealing. This housing can hold filters of different micron ratings, giving you the flexibility you need for large scale filtration. Cartridge dimensions: 30-3/4" x 7-3/4"
NOTE: Standard option SBMJ8 series housings are in-stock and ready to ship. Customized versions will require a 2-3 week time for customization and manufacturing. For more information on returning customized items, see our Returns Policy.